The northern lights are one of nature’s greatest spectacles. I remember the first time I saw the Northern Lights like it was yesterday. It was well over 10 years ago, maybe 15 years ago by now. I was returning back home from Toronto to the Hamilton area after my rock band had played a show. There was a bite to the air on that crisp, November night. As we drove down the QEW towards home, there was a faint glimmer of green in the sky. One of my band mates thought that it could be the Northern Lights. But, the Northern Lights? In Southern Ontario? The best places to see the Northern Lights are typically way farther north. As I got home, the green light in the sky grew more and more intense. I remember waking up my parents and telling them to come outside. Along with my sister, the four of us could hardly believe our eyes. It was indeed the Northern Lights, visible right above our house. I stayed outside longer than everyone else, even though I could practically see my own breath against the night sky. I grabbed a blanket and stretched out facing the sky. The sky pulsated and glimmered green. Waves of emerald etched across the dark expanse, advancing and retreating, appearing and withdrawing. I stayed out there for hours; I couldn’t look away. It was inspiring, awesome, and brilliant. After that night, my obsession for the Northern Lights grew and grew. I looked up information online about them, gazed at real time photos of them from around the world, and researched how I could see them again. Sadly, I have yet to view the Northern Lights since that date. However, I’ve researched the best places to see the Northern Llights around the world with the intention of booking a future holiday. Trips to see the Northern Lights are plentiful as this beautiful spectacle can be witnessed in many countries around the world, throughout many months. The Northern Lights, or aurora borealis, is a natural phenomenon in the night sky. This dramatic display originates as a burst of charged particles from the sun. The solar wind blows these particles along the sun’s magnetic field lines throughout the solar system. While most of these particles are directed away from earth by the magnetosphere, some become trapped near the earth’s magnetic poles. When the energized particles strike the neutral particles in our planet’s atmosphere, a colorful glow appears in shades of green, pink, blue, purple, yellow, and red. These are the Northern Lights. Did you know that there are also Southern Lights? Also known as aurora australis, it’s the southern counterpart to the Northern Lights. They’re visible primarily in Australia, New Zealand, South Africa, Argentina, Chile, and Antarctica. First, you need to travel to a place where it’s easy to see the Northern Lights. Next, make sure you’re there during the right time of year. I’ll provide individual tips under each destination below. It’s easiest to see the Northern Lights when the night is longer during the wintertime. Make sure the sky is clear without any cloud coverage. Another great tip is to get away from any places with light pollution. Dark sky preserves or anywhere far from the city are the best places to see the Northern Lights. It can be hard to predict when the Northern Lights will appear. There are no guarantees. Your odds increase when you choose a country (and specifically, regions within a country) where you can regularly see the Northern Lights. 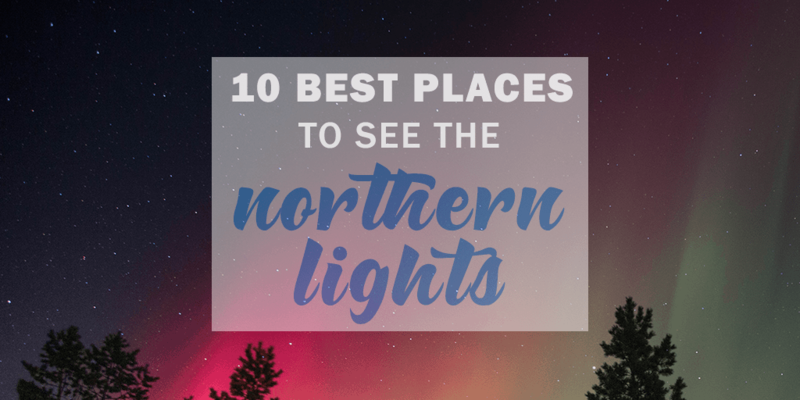 I’ve listed the 10 best places to see the Northern Lights. If you travel to these places during certain times of the year, you’ll increase your chances of viewing this spectacular wonder. I recommend staying up to date with aurora notifications. You can download the free Aurora Alerts app for Android, and here’s the one for iPhone. You can also join the popular Aurora Borealis Notification Group on Facebook. Spaceweather.com offers free aurora alerts sent to your inbox. For something a little more technical, you can stay up to date on current space weather conditions at the Space Weather Prediction Center website. As my first choice, I’m going with the only place I’ve ever seen the Northern Lights: Canada! However, I don’t recommend visiting the Toronto area if you’re looking to see them. I’ve only seen them once here throughout my entire life. Instead, look to the north. There are so many destinations where you can see the northern lights in Canada. The most popular spots are our northern territories of Yukon, Northwest Territories and Nunavut. Otherwise, head to the northern sections of BC, Alberta, Saskatchewan, Manitoba, Ontario, Quebec, and Newfoundland. You have the best chance of viewing the Northern Lights in Canada during the winter months from October to April (best between January and March). In Churchill, Manitoba, you can book an aurora tour where you can view the Northern Lights from heated domes (check out their aurora forecast here). In Dawson City, you can see the Northern Lights from the end of August through until April (check out their aurora forecast here). Jasper National Park in Alberta is the second largest dark sky preserve in the world, so you’ll have a good chance of viewing the Northern Lights in the winter. Sleeping Giant Provincial Park in Ontario is another great spot for aurora peeping, located an hour north of Thunder Bay. 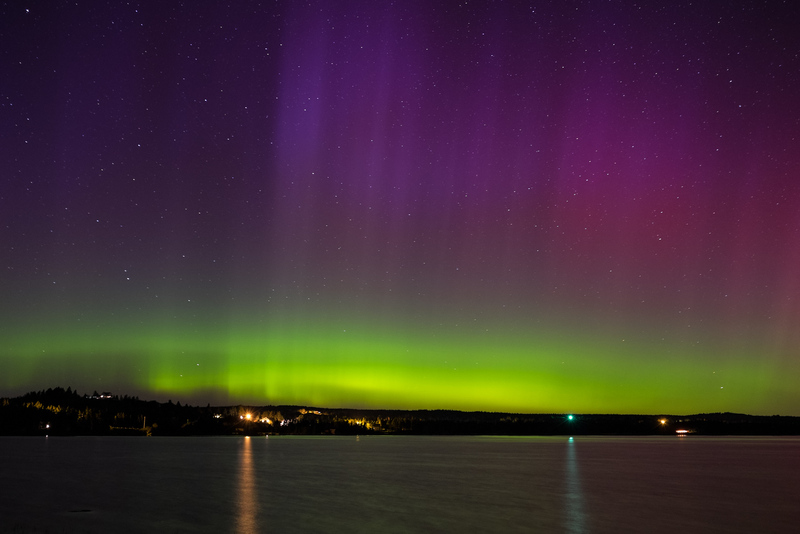 Staying in Ontario, Gordon’s Park on Manitoulin Island is a dark sky preserve and they also have special aurora borealis weekends. For even more Canadian Northern Lights inspiration, check out this map by Canadian Geographic detailing the best places to see the Northern Lights in Canada. If you’re looking to cheap flights to anywhere in Canada, I suggest searching on Skyscanner. 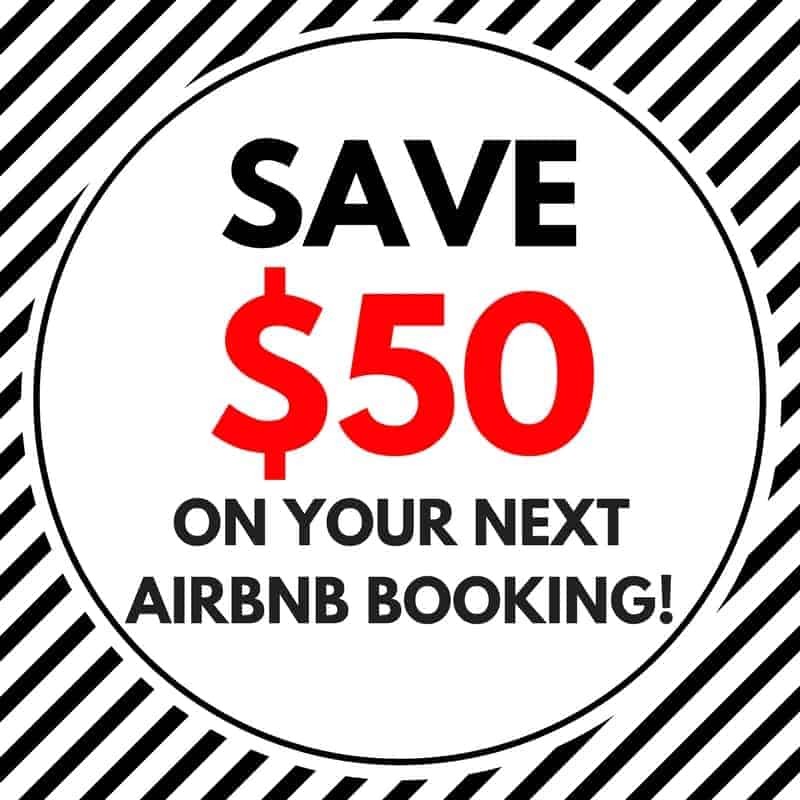 And start your hotel search on Booking.com – I love their free cancellation policy! My next choice for potential trips to see the Northern Lights is our neighbor to the south, the United States of America. For the best places to see the Northern Lights in the USA, you’ll actually have to head north to Alaska or to the northern regions of several US states. 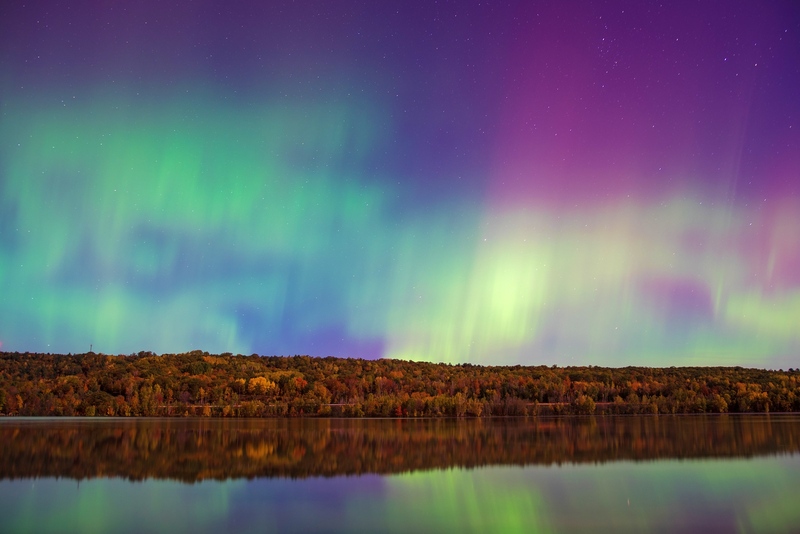 You might be able to see the Northern Lights in northern Idaho, Michigan’s Upper Peninsula, northern Minnesota, the Aroostook National Wildlife Refuge in Maine, or North Dakota. 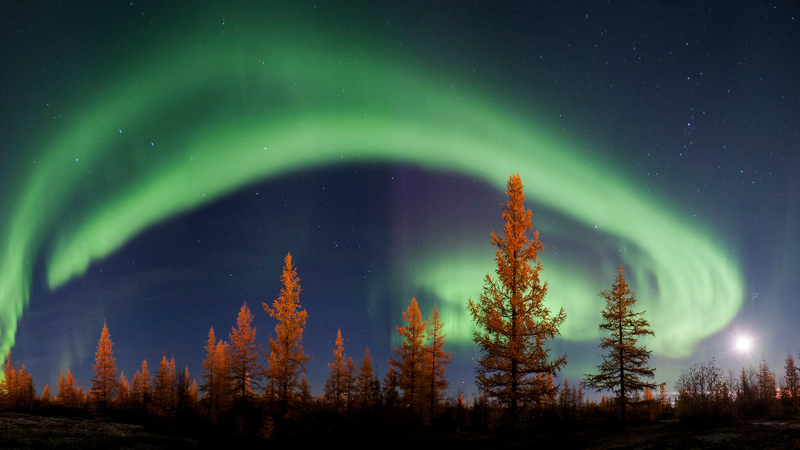 In Alaska, you can book several Northern Lights tours like this one from Fairbanks that takes you up to the Arctic Circle. 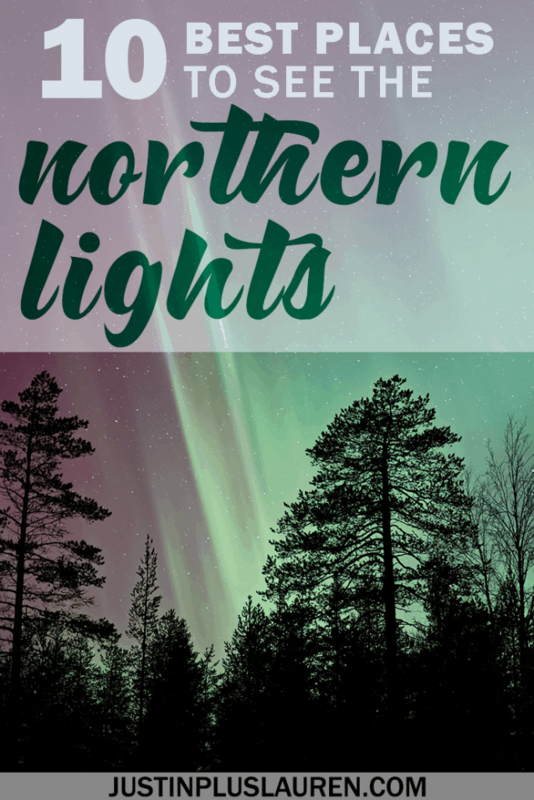 This tour combines viewing the northern lights with hot springs, and that sounds like the perfect combination to me. I recommend heading to Alaska during the winter months for your best chances to view them. Book a cozy Airbnb for your stay. Check out the University of Alaska website for the latest aurora forecast before heading out for the evening. Scoop up a great flight deal on Skyscanner and you’ll be on your way! According to the Norway Lights website, you can see the Northern Lights all over Norway, particularly in the north. They even have a very detailed aurora forecast site where they recommend you GO, TRY, or WAIT on any given night. You can see the Northern Lights in Norway from Tromso, Hamn in Svena, Kirkenes, Svalbard, Lakselv, Harstad, Alta, Andoya, Bodo, and The Lofoten Islands. The aurora is best viewed between October and March. In Norway, there are Northern Lights tours for every interest, combining a variety of activities. 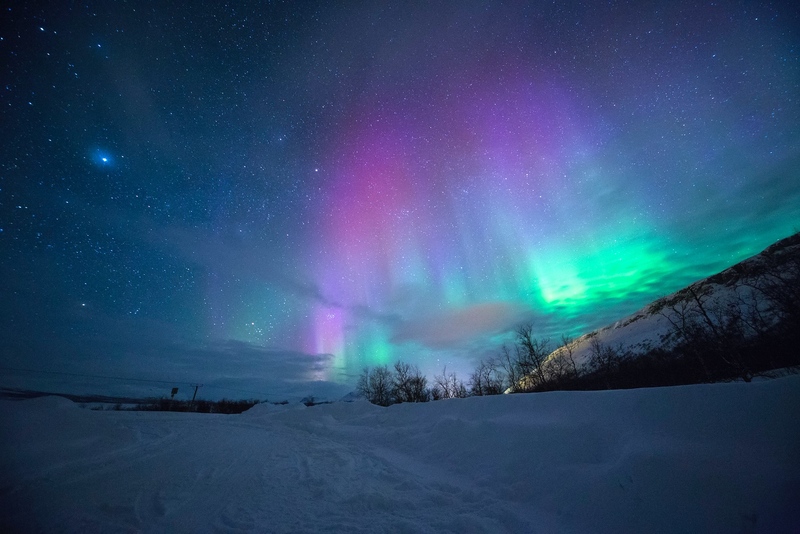 For the traditionalist, take the Northern Lights photography tour from Tromso. Want to do something a little more active? Try a night snowshoeing tour with the Northern Lights dancing overhead. For a true adventure, take an overnight boat expedition to see the Northern Lights from the sea overnight and wake up to a whale watching tour. The best way to guarantee Northern Lights sightings in Norway? Book the 7-night aurora pass. This pass provides you with the flexibility of attending tours only on the nights where the aurora will be visible in the night sky. Stay overnight at the Tromso Ice Domes for a unique and once in a lifetime experience (or simply visit for the day). Check out this listing of hotels in Northern Norway to begin your accommodation search. One of the best places to see the Northern Lights in the world is Iceland. 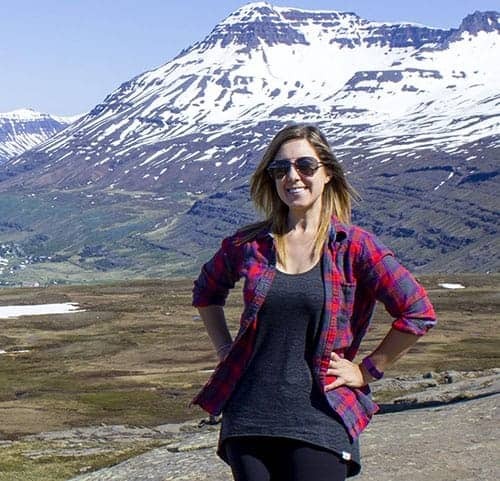 From North America, there are so many cheap flights to Iceland and the journey is relatively short, especially if you’re on the east coast. There’s no better reason to jet off to Iceland than to view the brilliant aurora! 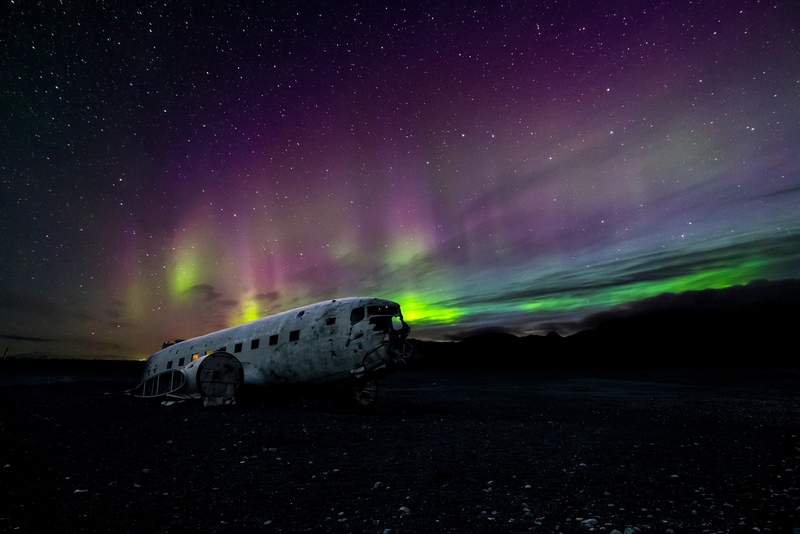 You can begin to see the Northern Lights in Iceland as early as late August through to the beginning of May. Keep your eyes on Iceland’s official aurora forecast website to see if they’re visible on any particular night. The best places to see the Northern Lights in Iceland? All over the place! From the Snaefellsnes Peninsula and Kirkjufell Mountain to the northern town of Husavik, you’ll have possible success wherever you go. How dreamy would the Northern Lights look from the westernmost point in Iceland, the Latrabjarg Cliffs? Depending on the weather, some regions might be trickier to reach than others in the winter. Don’t fret: there are plenty of tours where you can chase the Northern Lights leaving right from Reykjavik. You can take a Northern Lights tour by Superjeep, an aurora cruise, a small group premium tour, or an extended 7-hour aurora chasing tour. The Northern Lights put on a dazzling show in Greenland. Head to this less-traveled island between September and the beginning of April for the best odds of seeing them. As Greenland is sparsely populated, you’ll have an easy time finding a dark sky and therefore, a better chance of viewing the Northern Lights. 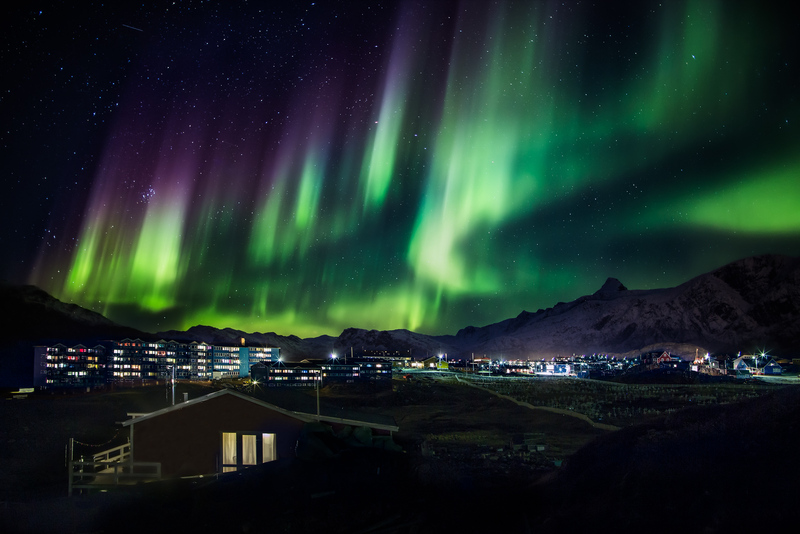 The best places to view the Northern Lights in Greenland are Kangerlussuaq, Sisimiut, Ilulissat (also a UNESCO World Heritage Site), Nuuk, and Kulusuk. Embarking on an arctic cruise is one of the coolest and most memorable ways to view the Northern Lights in Greenland and beyond. Gaze up to the night sky as you sail between destinations in the north, discovering the regions by land and sea. Finland claims that you can see the Northern Lights up to 200 nights per year. Those are pretty amazing odds if you head there for a week or two in the winter! 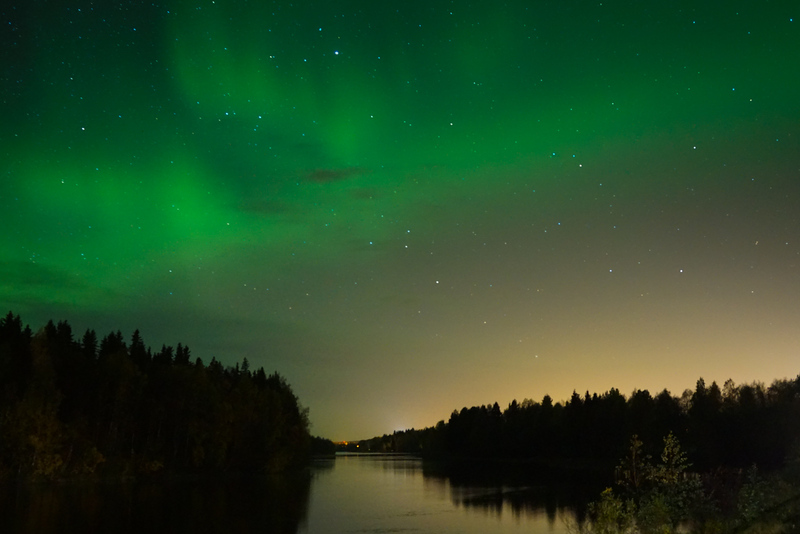 Finland is right in the middle of the aurora zone, making the conditions ideal for viewing the aurora borealis. 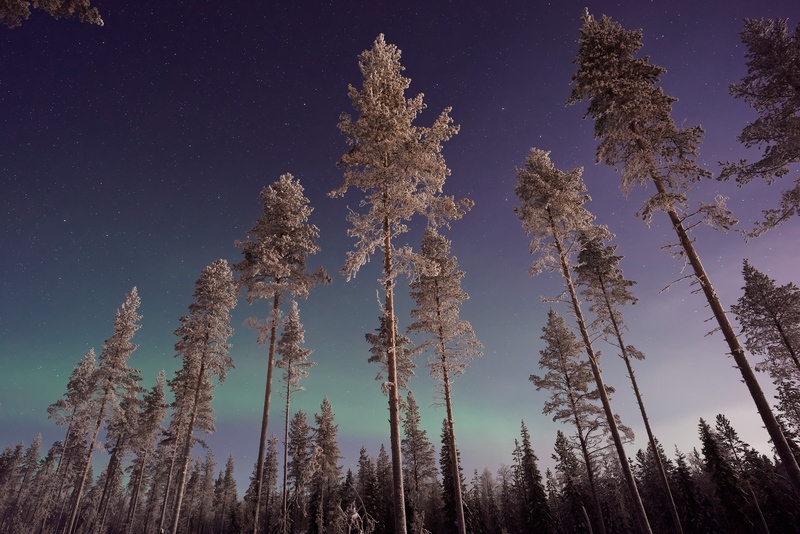 Be sure to head to the Lapland Region to see this brilliant natural display illuminating the night sky. Finland isn’t quite as popular as Iceland or Norway in terms of tourism, so you might find that there are less crowds. Even still, there are a variety of awesome and unique tours that range from your typical photography tour to ice floating in an insulated suit. You can also combine Northern Lights hunting with snowmobiling, a snowshoe hike, and a forest sauna and hot tub. View the Northern Lights from the Kakslauttanen Arctic Resort in your own glass igloo for a memorable experience. Sweden, in particular Swedish Lapland, has numerous places to view the Northern Lights. You also have a really excellent chance of seeing them in the winter, especially in December and January (they are visible between September and April). Swedish Lapland has a variety of unique accommodation choices to heighten your Northern Lights experience. Stay at the Abisko Mountain Lodge and book a transfer to the Aurora Sky Station where you’ll have a 100% chance of seeing them if you visit for three nights. The ICEHOTEL in Jukkasjärvi offers a new experience every winter as the hotel is built from scratch from ice and snow. And you can even stay at the TreeHotel up in the treetops for an epic accommodation experience and amazing Northern Lights scenery. Looking for an even more remote and interesting Northern Lights experience? Head to Russia to the tundra zone at the Arctic Ocean. The Murmansk region, above the Arctic Circle, is a prime aurora viewing site, especially along the coastline of Teriberka. Murmansk receives 40 days of uninterrupted night in December and January, making these months the best times to visit. You can also try the town of Arkangelsk, also situated above the Arctic Circle. When thinking about the best places to see the Northern Lights, Russia likely doesn’t immediately come to mind. However, you might have the wildest experiences there. If you’re a true adventure seeker, check out the Novaa Zemlya northern archipelago. You can only visit by special permit. It’ll only be you and the roaming wild deer below the dancing skies. 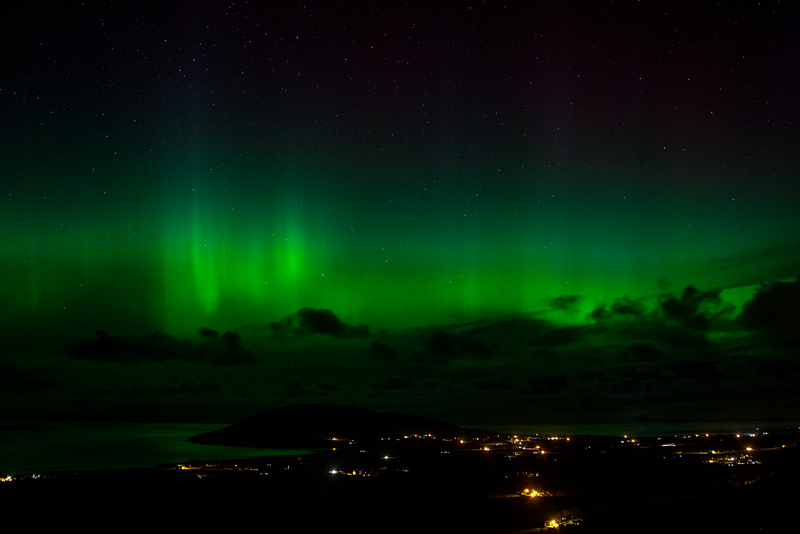 Yes, you can see the Northern Lights in Ireland! It might not be as reliable, but it’s still one of the best places to see the Northern Lights in the world. You’ll have the best chances if you head north and visit in the winter. I recommend heading to Malin Head, Ireland’s northernmost point in County Donegal. I visited Malin Head during the day in the fall, and the coastline there is absolutely stunning. To explore Ireland and its Northern Lights, book a small group tour experience to travel with like-minded people, exploring every corner of Ireland. Other fantastic spots to see the Northern Lights in Ireland are the Inishowen Peninsula, the Rosguil Peninsula, and Dunree Head. Visit places with little light pollution with a clear northwards view. Rounding out our list at number 10, Scotland is one of the best places to see the Northern Lights. Just as in Ireland, you can also see the Northern Lights in Scotland. They are most visible in autumn and winter on clear nights. You’ll want to head north to places like the Shetland Islands for your best chances. 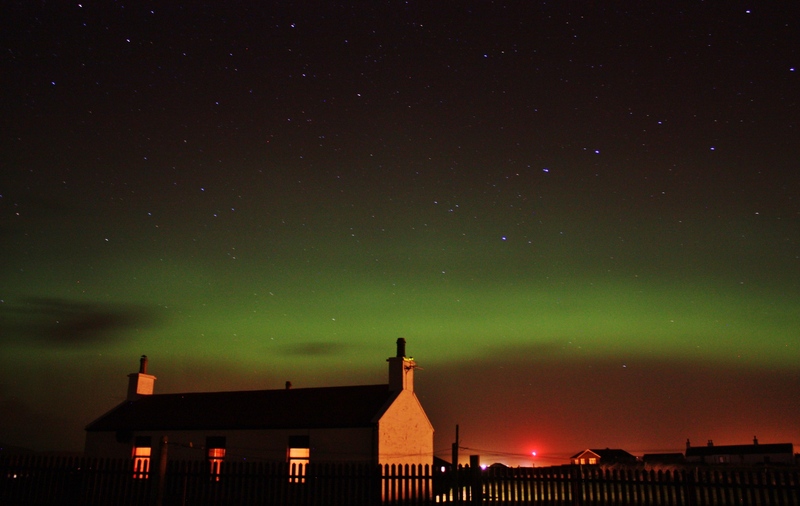 There are numerous dark sky discovery sites in Scotland, including 9 on the Isle of Skye alone. You can also try to gaze at the “Mirrie Dancers” at the Galloway Forest Park, The Cairngorms, Angus and the coast of Fife, or even Arthur’s Seat in Edinburgh if the aurora is particularly intense. If you’re seeking the best places to see the Northern Lights, I recommend that you start with these 10 countries. You’ll have numerous opportunities to witness this dramatic spectacle. Seeing the aurora borealis was a life changing experience, and I am certain that you’ll fall in love with this wonder of nature, too. Book several trips to see the Northern Lights. You won’t regret it! Have you seen the Northern Lights and where? Tell me your story!